I'm still trying to recover from being sick, as we ease back into our daily school routine and work towards finishing up our second quarter for this school year, which will end on January 24th. In the meantime I am going to work on sharing a few more pictures from earlier in the quarter and from our Christmas break! 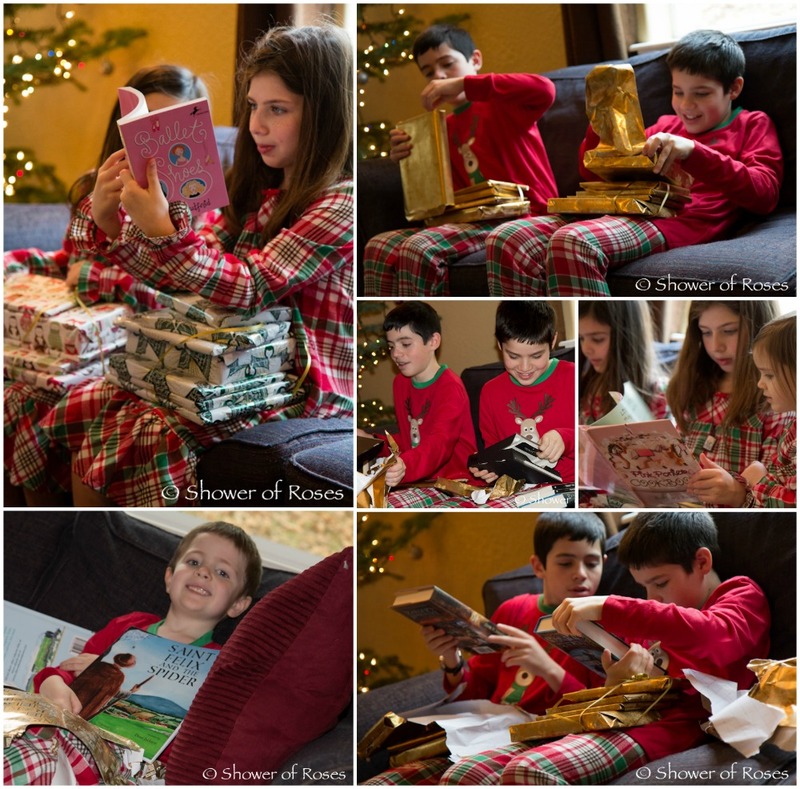 Last year I was inspired by Charlotte to give our children each a stack of books for Christmas this year! It was such a hit, especially with the older children. I love that they (at least most of them!) 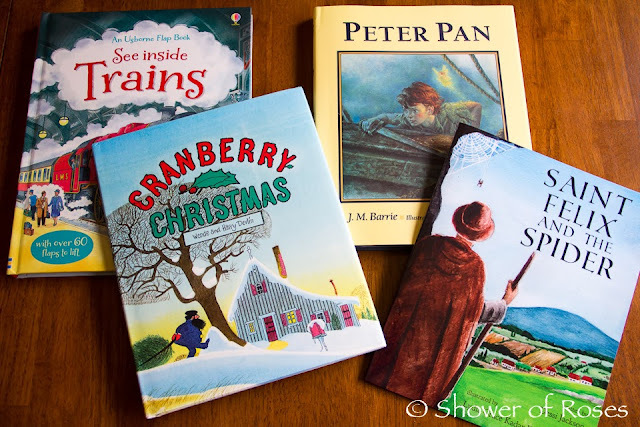 love receiving books as gifts as much as I did as a child. Captain (age 13) received the basic Kindle e-reader (the 6" Ink Display, "without special offers" version, purchased on sale - it won't let me link directly...), this cover, and The Invaders: Brotherband Chronicles #2, The Gate (the new book by Nancy Carabio Belanger is now available at Amazon) and Twenty Tales of Irish Saints. Rascal (age 11) also received the basic Kindle e-reader ("without special offers" version, purchased on sale), this cover, and The Royal Ranger, The Haunted Cathedral and The Fire of Eden. 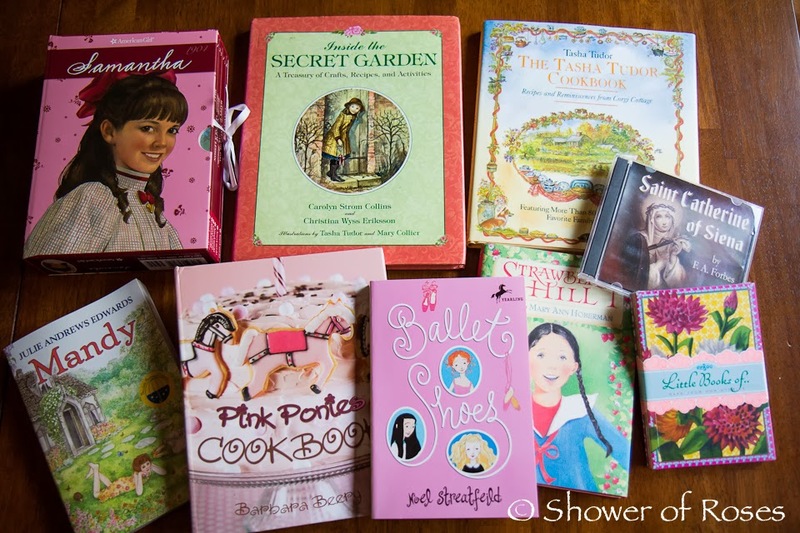 Twinkle Toes (age 10) received the Samantha Books Set, Samantha Just for Fun (not pictured), Inside the Secret Garden (illustrated by Tasha Tudor - she received The Secret Garden also illustrated by Tasha Tudor for her birthday), The Tasha Tudor Cookbook, Mandy, Pink Ponies Cookbook, Ballet Shoes (somehow this ended up in TT's stack instead of C's, oops! 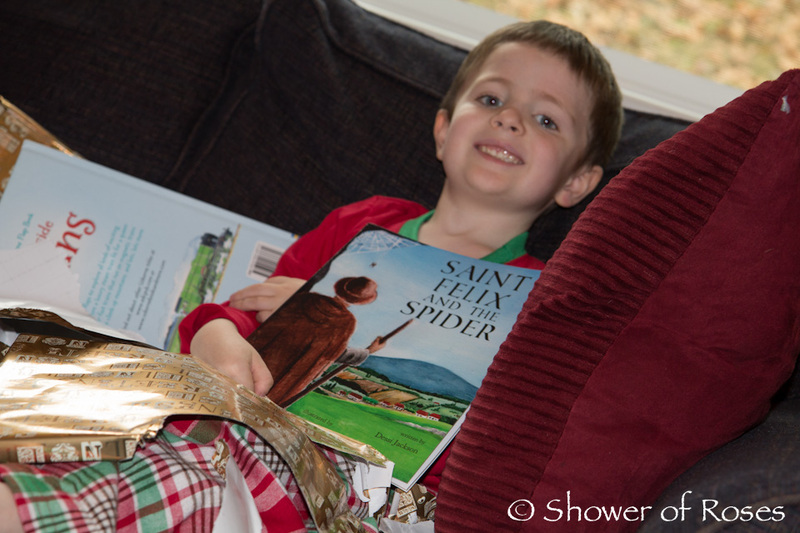 ), Strawberry Hill, Saint Catherine of Siena Audiobook, and a set of Little Lined Books... in her stocking. 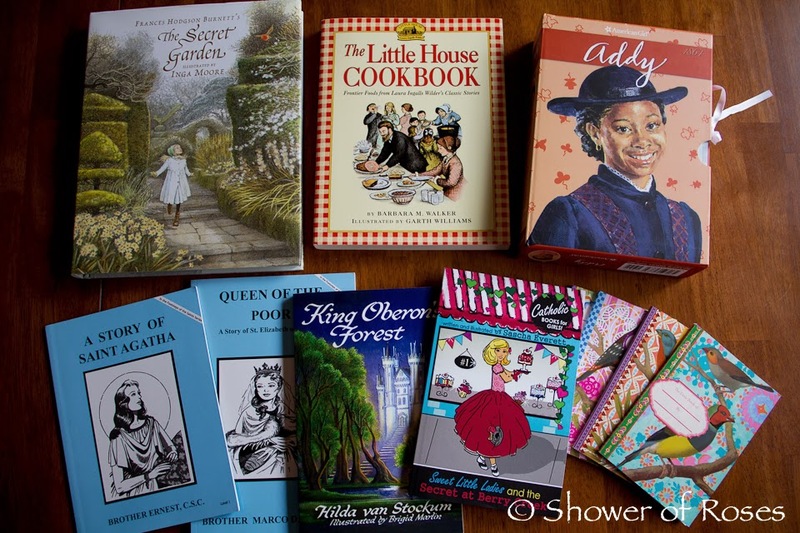 Chiquita (age 8) received The Secret Garden (illustrated by Inga Moore), The Little House Cookbook, Addy Book Set, Rebecca Just for Fun (not pictured), A Story of Saint Agatha, Queen of the Poor, King Oberon's Forest, Sweet Little Ladies and the Secret at Berry Creek and a set of Little Lined Books... in her stocking. 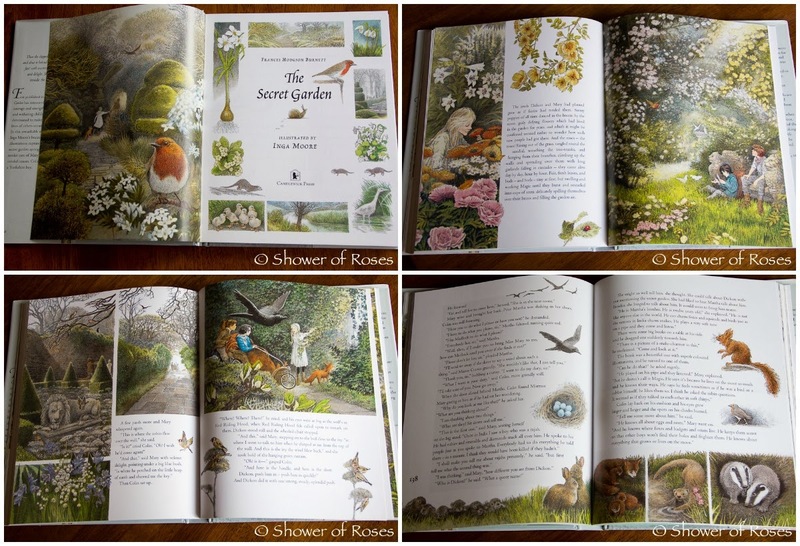 I just love the illustrations in this version of The Secret Garden illustrated by Inga Moore. Even though Snuggles was excited when he opened his first four books, by the time he opened the fifth (See Inside Trains) he wasn't so sure he loved the idea of a stack of all books. As he was opening the last book we all couldn't help laughing when he we overheard him quietly saying "Please don't be a book, please don't be a book, pleeeeassse don't be a book... Oh NO! It is a BOOK! And it's a bad one... There is a FAIRY in it!" Poor boy! ;) It took his older brothers a couple minutes to explain that it was Peter Pan... He loves Peter Pan! 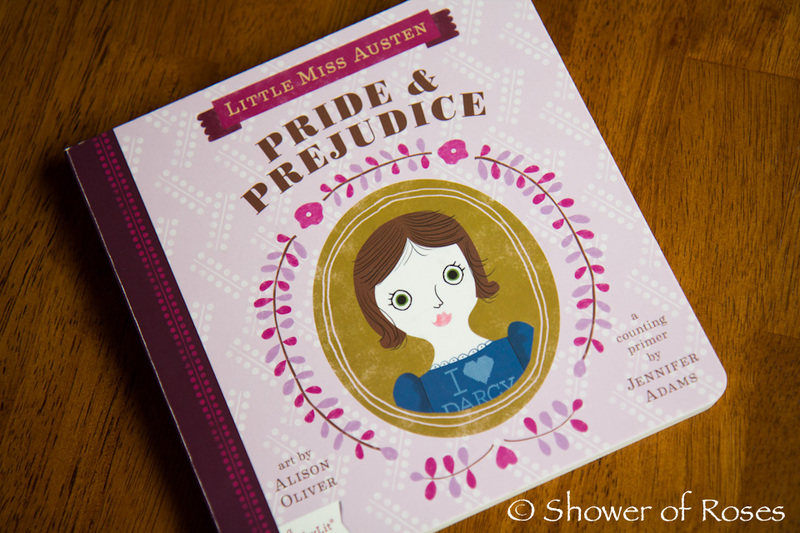 On Christmas Rose received Pride & Prejudice: BabyLit Counting Primer. 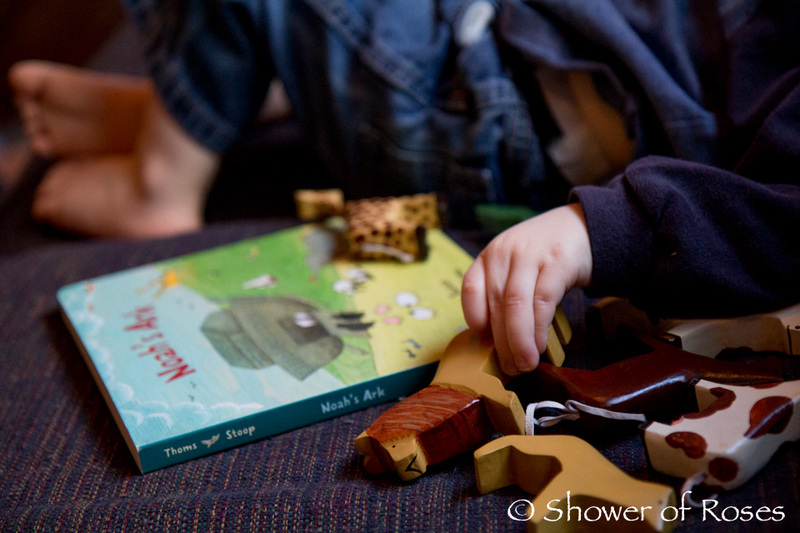 Bud's Noah's Ark Board Book is his new favorite to read before nap time! We have been reading it every afternoon. 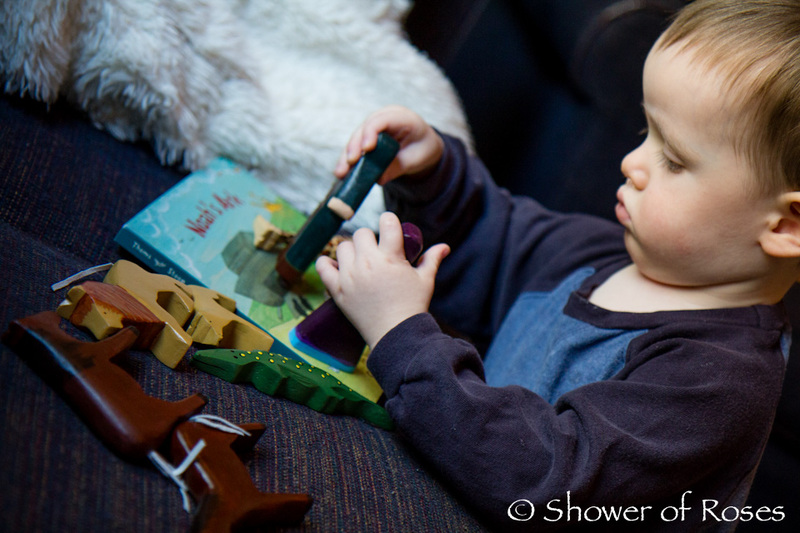 . .
His favorite page is the one where all the animals are "sleepy" and "nigh nigh!" I also pre-viewed a copy of the darling book Red Knit Cap Girl by the same illustrator, before wrapping and sending it to one of our goddaughters for Christmas, along with a little doll I hand-painted... and LOOK!!! Charlotte's darling photo was featured on the author's blog! I just love all of her illustrations and I've already ordered a copy of Red Knit Cap Girl for our family, along with a copy of All Creatures Great and Small to include in Easter baskets this spring! Happy New Year! Thanks for sharing your lists. These will be great for future reference when my boys are a little older! Hope you are feeling better! 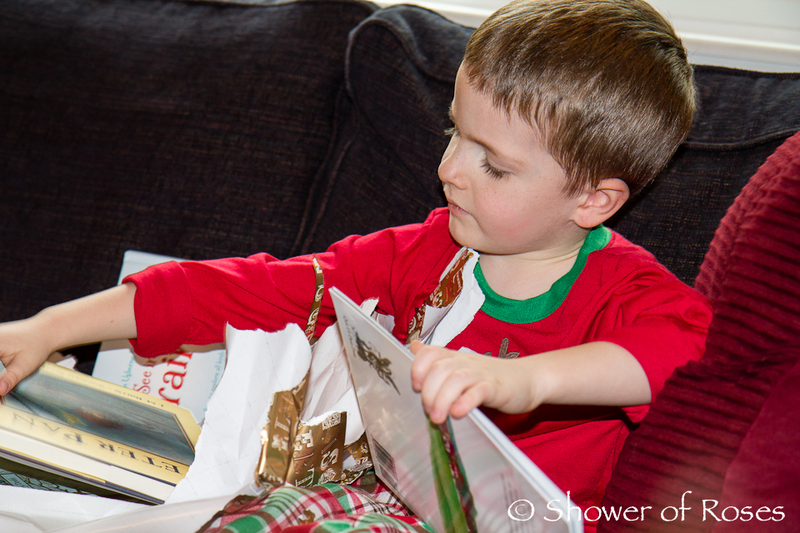 Books are a wonderful present. 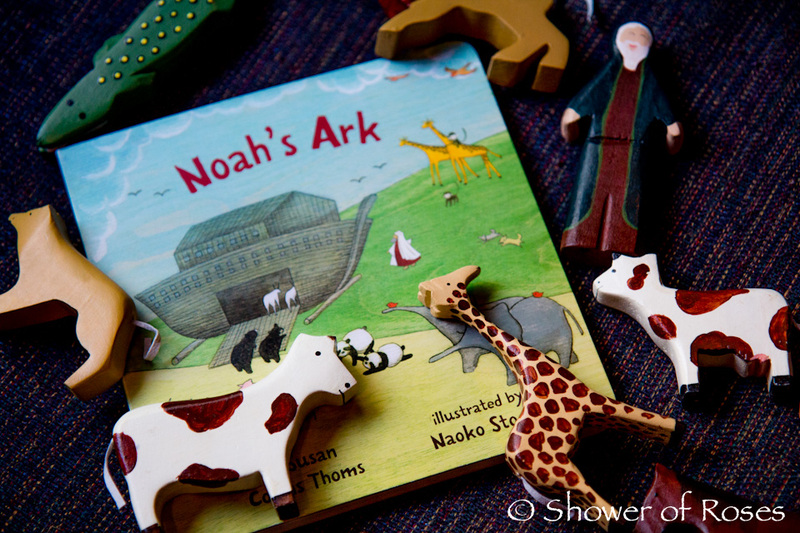 May I ask where you got the wooden Noah's ark animals? I purchased the Enchantmints Mr. & Mrs. Noah + 10 Lucky Animals from Magic Cabin during a pre-Christmas sale. Bud loves them! However, he has pulled the little tail off one of the lions already... I'm thinking that the rest of the tails aren't going to last very long. I'm going to have to figure out how to reattach them. I had purchased the Ark as well, but it is very poorly made (plus arrived broken) so I returned it before Christmas and had been looking into other options including this Ark from Maxim. 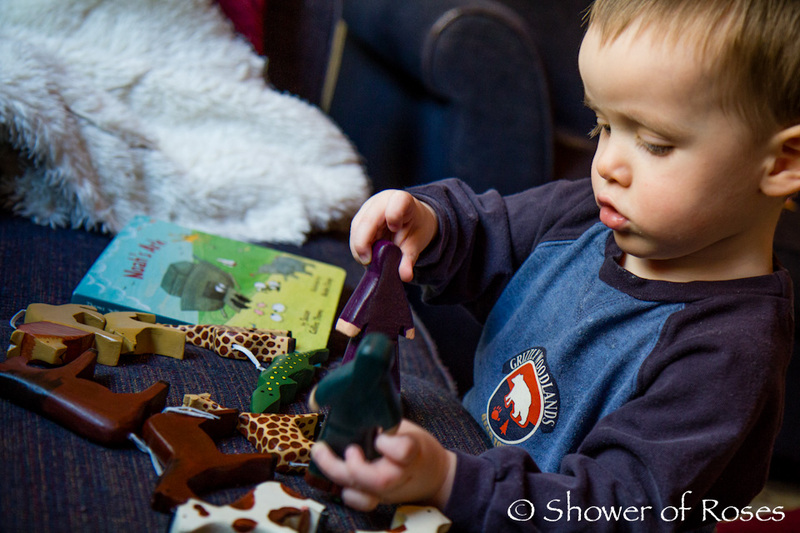 I never did purchase a replacement before Christmas, but he really loves the book and wooden animals! 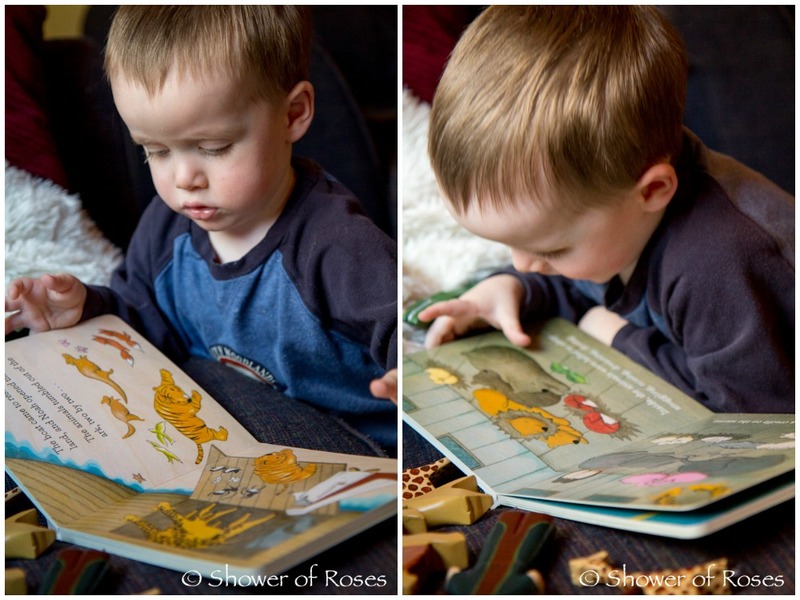 love these pics:) checking out your titles:) some boys ones I don't know and I;m just waiting for my girl to be an independent reader to buy the Berry Creek book. I also pre-ordered a copy of the new Baby-Lit Board Book Adventures of Huckleberry Finn: A Camping Primer which sounds really cute too. Twinkle Toe's pile makes me smile. The Secret Garden and Mandy are some of my fav's that were read over and over when I was about her age. 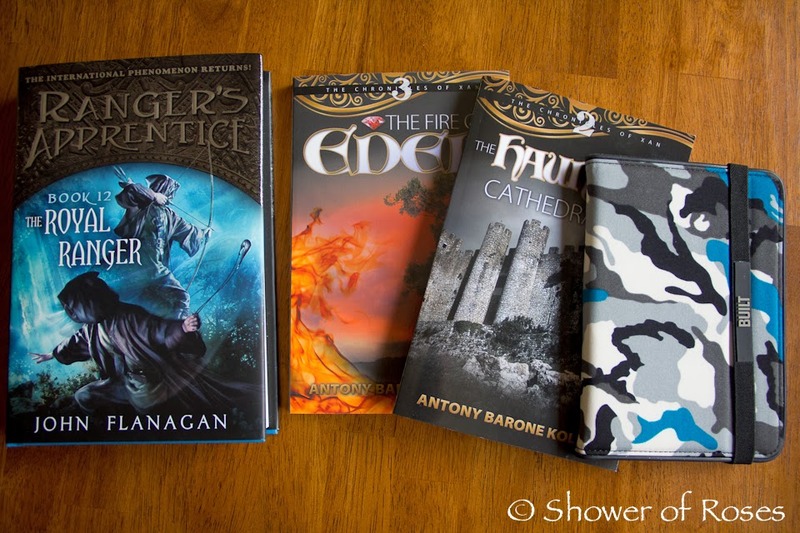 Love seeing your lists of books! I love your book list posts! I get so many ideas for my own crew from your lists. Thanks for sharing! I absolutely LOVE that version of Peter Pan. It was a must own after I read a library copy. The illustrations are beautiful!! My favorite picture is the two page one of a glance inside Peter's hideout with all the lost boys, Wendy, and Peter. As a word of caution for all parents, know that kindles can browse the internet, albeit rudimentarily, and still bring up inappropriate images. Treat it as a computer, so make sure to disable internet access or enable parental controls. BTW, love your website and find it really inspirational. God bless you and your beautiful family.